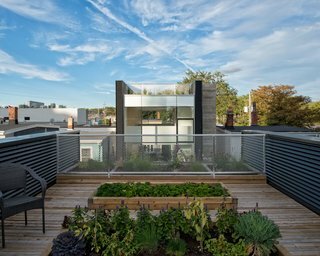 In Halifax, Canada, this modern multi-use residence by Susan Fitzgerald Architecture fosters a sense of community through living, working, and growing. In a transitional neighborhood in Hailfax, Susan Fitzgerald and her builder partner Brainard embraced the diverse and evolving community around them to design a property that would be more than just a modern dwelling for their family. 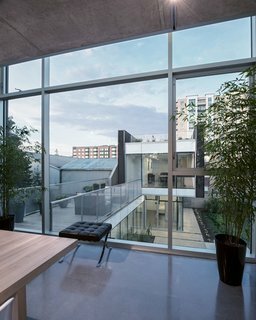 Along with their own residence, the design called for commercial space for their firms, and a live/work rental unit. The three-unit project would be anchored by a common courtyard, and allow for functional flexibility of each space as the families and businesses grow, change, and evolve. Central to the project were landscaped outdoor areas for growing flowers and vegetables, a forward-thinking exploration into urban agriculture and sustainability in an otherwise unplanted part of the city. 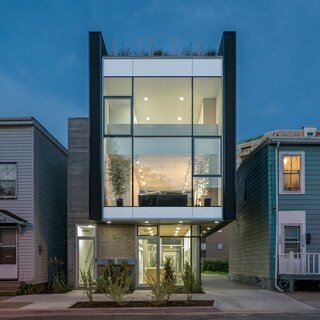 The home’s front façade features an anodized aluminum and glass curtain wall by Kawneer that's framed by Vic West black corrugated metal panels. The board-formed concrete on the exterior enables passive solar absorption, allowing optimal heat retention on cold winter days. 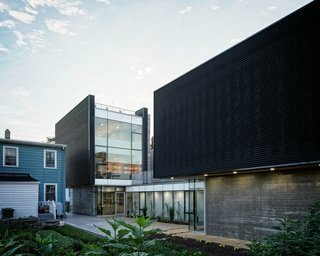 The metal and concrete exterior cladding offers cohesive dialogue with the neighboring industrial sheds and commercial buildings. The main living area is connected to the back unit by a modern bridge. Polished concrete is used for both floors and ceilings, and a Mies van der Rohe Barcelona Stool accents the space. On the lower roof, cedar decking and flower beds define one of several outdoor gardening spaces. Part of her ongoing research into the livability of cities, Fitzgerald aimed to create landscaped areas that were "aesthetic, aromatic, educational, and productive." The deck is bordered by an expanded aluminum mesh railing and black metal corrugated panels. Challenged by the dimensions of the narrow lot, the team worked through significant programmatic and logistical constraints during the design and construction process. The final concept for the layout was a modern take on the side hall plan. The living spaces are stretched back deep into the lot, and strategically raised above grade to allow sunlight to penetrate into multiple living spaces. The multifunctional courtyard serves as outdoor workspace, gardening area, children's play area, and covered parking during winter months. Childrens’ bedrooms are reimagined as cozy private cubbies, much like sleeper cars on a train. These compact rooms were designed to encourage outside interaction with the rest of the household during the non-sleeping hours of the day. Sliding doors and baltic birch built-ins complete the rooms. The sleeping cubbies lie beneath the walkway connecting front and back units. Cedar decking and soffit add warmth and texture to the transitional space. Concrete was chosen for both structural and finish material throughout much of the home, for its aesthetic, functional, and budgetary appeal. The polished concrete floors in the bedroom complement the birch bed and cabinetry. 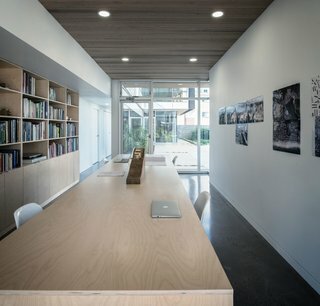 The home provides living space for the couple, two kids, one dog, and two cats. 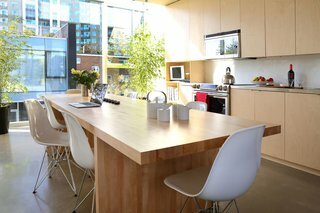 The kitchen features stainless steel prep counters, a Samsung stove, and Panasonic over-the-range microwave. The room is bordered by two full walls of windows, allowing light to flood the space at all times of the day. A custom birch butcher block table furnishes the family gathering space. 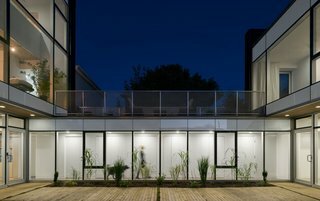 Positioned on the ground floor, the office enjoys spacial privacy, while still having intimate interaction with the living area above and common courtyard.